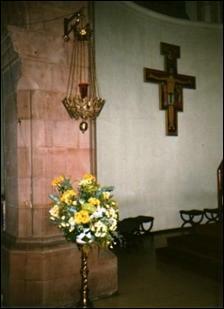 The Sanctuary lamp was made by craftsmen of the Polish Army. An example of wrought work in brass and bronze. 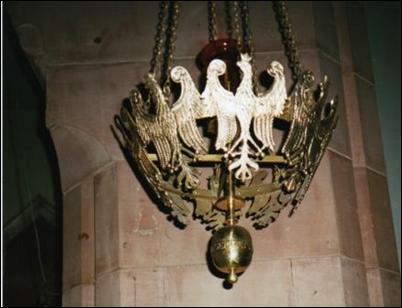 It is surmounted by a crown supported originally by two bands of finely wrought Polish eagles. Suspended from the base is a ball which bears the inscription “Polonia Semper Fidelis”. It was made by the tank company of the 1st Corps Recce Group, based in Perth. On 3rd May 1941 there were celebrations marking the 150th anniversary of the Polish Constitution, and also of Our Lady, Queen of Poland, in St John’s RC Church in Perth. There was a ceremonial dedication and transfer of the Lamp to St John’s. In a letter addressed to General Kukiel, Commander of I Corps, the Bishop of Dunkeld, John Toner, thanked the soldiers of the Recce Gp for this beautiful gift that is an expression of love and devotion to the religion of the Polish nation. The Bishop expressed his admiration and appreciation for such a beautiful, artistic work and his pastoral blessing for Polish soldiers in the whole diocese. In response, General Kukiel sent a letter to the Bishop of Dunkeld stating that the Poles are grateful for the Bishop's words of appreciation and express their deep gratitude for the blessings given to them. This Corps unit was based in Perth from October 1940 to April 1942. Other units identified in Perth in 1941 include : HQ of the 4th Armoured Train Group; a Polish Military Bureau, Ordnance Depot, Field Court Martial and Highest Court of Appeal and the Polish Field Post Office.